Lightning struck twice in just over a minute in the middle period to recover from a first break deficit but there was always a suspicion that the Scottish visitors still had another gear to slip into. And so it proved when they came up with a trio of goals to eventually win 4-2 and take a vital step to securing a play-off place. 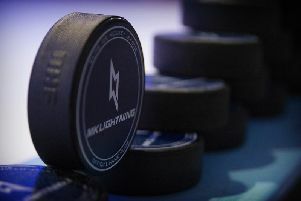 The following day Lightning never gave up the battle in a 6-5 loss at Manchester Storm. Against Fife for Lightning fans still coming to terms with the news that the team is to step down into a newly formed National Ice Hockey League division next term with imports restricted to two per team all they were left with to cheer was the last gasp drama of a bout of fisticuffs between Nelson Armstrong and Flyers’ Danick Gauthier. The MK player just about edged the battle but picked up a two minutes plus 10 penalty for instigating the fight which also saw both players receive five minute calls. It took until 18mins 21secs for Fife to edge in front while Trevor Morbeck was sin binned for tripping – Joe Basaraba’s blue line blast rebounding off goalie. Patrick Killeen for Marcus Basara to follow up. Andreas Valdix levelled the tallies on 28mins 4secs with goalie Shane Owen spreadeagled on the ice – the puck somehow finding a way under him. Just 1min 3secs later Lightning were in front thanks to a close range poke in from David Norris. Bari McKenzie finally put Flyers back on terms after 44mins 45secs as he seized on a rebound off the pipework from Craig Moore. Buoyed by that goal Fife forged ahead at 46mins 57secs with top scorer Brett Bulmer finishing off. At this stage it was Flyers putting on the pressure and they further increased their lead after 52mins 5secs thanks to Paul Crowder with a scrambled effort. Lightning tried in vain to fight back but there was too little gas in the tank. The home side’s chances were eventually scuppered by the clash between Armstrong and Gauthier which resulted in the additional penalty for the MK man and a powerplay for Flyers. 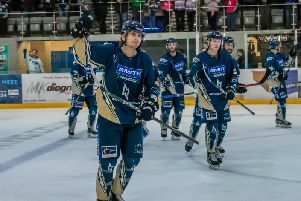 On Sunday despite the news that they have virtually no chance of being on Lightning’s roster next year having sunk in it did not stop Tim Wallace’s battling army from giving Manchester Storm a shock at Altrincham on Sunday. At 6-3 in favour of the hosts with just over six minutes remaining it looked to be game over for Lightning. But try to telling that to MK’s short-staffed troops who carried on competing until the end and were rewarded with two late goals to run Storm close in a 6-5 result. Following coach Tim Wallace’s ethos they set out to impress at Storm but quickly found themselves a goal behind when captain Dane Byers found the net beyond Adam Goss – given the start instead of Killeen – after just 1min 4secs. A 10th minute penalty call on Michael Fine allowed Storm to double their advantage through Dallas Ehrhardt at 12mins 17secs. The two teams each had a man in the penalty box – Harrison Ruopp for roughing and Wallace for tripping - when Lightning were awarded an unsuccessful penalty shot. However it was not long before they cut the deficit with Georgs Golovkovs and Nelson Armstrong involved in Robbie Baillargeon’s strike at 19mins 16secs. Storm added goal number three through Ciaran Long at 32mins 23secs. Long then turned villain when he was sent to the cooler for holding on 43mins 5secs. That gave MK the chance to reduce the arrears as David Norris supplied Ivan Šijan for a powerplay marker with four seconds of the man advantage remaining. Just over a minute later Manchester regained their two goal lead thanks to a Logan McMillan goal at 46mins 10secs before Ehrhardt bagged his second on 48mins 31secs. Šijan doubled his tally for the night at 52mins 7secs. McMillan was back on the scoresheet a minute and a half later with Manchester’s sixth goal at 53mins 38secs before it was down to Lightning to round off the scoring with a Fine goal after 58mins 3secs and then Armstrong got in on the act with 35 seconds to the buzzer to bring the visitors to within a goal of their hosts.